The Superintendent’s Interhigh Advisory Council recently had their first meeting of the year. This council is made up of high school students from Williamsville East, North, and South. The students get the opportunity to discuss issues within the district and give their opinion to each high school’s principal, district Superintendent Scott Martzloff, as well as someone from the Board of Education. The first meeting is usually just an icebreaker, where the students are able to interact with the other high schools. While this was still the case for this meeting, Dr. Martzloff brought up the future vote on renovating the music departments in all high schools as well as some small changes in the middle schools. This vote will be on Thursday, December 13th from 7am to 9pm at Williamsville North High School’s gym, with Dr. Martzloff hoping that the project will get approved. The Superintendent discussed many reasons for the district needing these renovations, such as showing the students pictures of North’s chorus room, where students have to duck their head in order to fit, or at East, where students in the symphonic orchestra are forced to practice on stage in the auditorium because they have no other space. These issues would be resolved by the proposition, which would add new and improved areas for the music departments in the high schools as well as other improvements, such as stage renovations. The stage improvements are for issues like the stage being too small for the large amount of students participating, along with improving the acoustics in the auditorium. And there are a lot of students involved. According to the Williamsville Central School District, over 50% of students in grades 3-12 are engaged in the music departments. 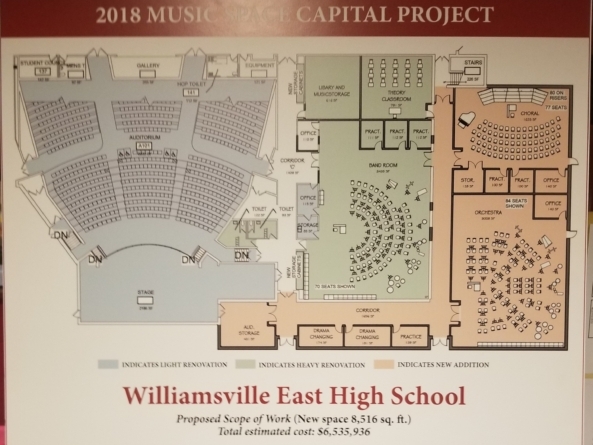 This capital project, named “Spotlight on Music” will cost a whopping 36.6 million dollars, including the costs of some other minor facility issues addressed by the proposal, such as replacement of the Transit Middle and Maple West roofs. This expensive project will not cause an increase in the tax levy for multiple reasons, such as the retirement of existing debts, the use of money reserved for such projects, and help from the New York State building aid, which should cover over 52% of the costs. This author has not added a biography. Meanwhile Daniel Krieger has contributed 11 posts. Click here	to view them.